At AJC, we are always trying to come with new ideas and innovations that make a hard job a little easier. Please check in often to see what new tools we have in the works. Whatever your needs are, AJC has you covered. Please feel free to browse our new products below. If you have any questions, do not hesitate to contact us – we would love to hear from you! Slate rippers are used to remove slates from an existing slate roof during repair or restoration. The tool is equally useful on tile shingles and cedar shake. A slate ripper is used to slide underneath broken pieces of slate and hook the nail that secures the slate. By hitting the handle with a hammer, the nail is pulled out, thus allowing the slate to be removed. The new AJC slate ripper with hand guard is the first slate ripper with overstrike protection for errant hammer blows. This mini shingle pad reduces scarring and scuffing as well as increases productivity. It also provides comfort to the roofer by greatly reducing back pain, fatigue and insulates against excessive roof heat. This is an AJC patented product. AJC core cutters are designed and built in the USA to be the fastest and easiest way to extract core samples from built up roofing (BUR). The Power-Core is to be used with heavy duty cordless and corded drills, with 1/2” minimum drill chucks and high torque motors. The Power-Core roof cutter uses a heavy duty threaded rod to power the cutting tube (drill forward direction) in taking core. When the core has been taken, simply reverse the drill direction to eject the core. This core cutter is 2 inches in diameter and extracts cores up to 7 inches deep. Heat treated. Check out the power core roof cutter in action! AJC’s 25 pound, 5-inch-wide polished heavy steel roof roller is a high quality and durable product. It also comes equipped with a handy collapsible t-handle. Please note that the AJC roof rollers do not come with legs. Contact us if you are interested in this heavy steel roof roller. AJC Roofing Tools - Made in the USA! Another first from AJC, this new silicone seam roller allows the user to generate a lot of pressure with little effort by using their own body weight - without sore wrists and elbows! 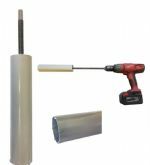 Our high pressure seam roller is great for rolling single ply seams and pressure-activated butyl tapes. This is a 1.75 inch wide silicone roller with dual grips. Contact us if you are interested in this silicone seam roller. 4" wide silicone 2-handed pressure roller. Another first from AJC. Dual grips allow users to generate a lot of seam pressure with little effort by using their own body weight--without sore wrists or elbows. Great for rolling single ply seams and pressure-activated butyl tapes.